Every Spring, Girl Scouts across the United States celebrate the founding of the American Girl Scout movement by Juliette Gordon Low in Savannah, Georgia on March 12, 1912. From that small beginning, a huge movement has positively impacted girls and young women for nearly a century. But Spring in Oak Park and River Forest also is known for another Girl Scout tradition anticipated by Scouts and non-Scouts alike: Girl Scout cookies! Starting each January, Girl Scouts go door-to-door and among their families taking orders for Thin Mints, Trefoils, Samoas, and more. After orders are placed, Girl Scouts deliver cookies to their customers beginning in late February/early March. In addition, troops set up sales tables outside banks, stores, and in business districts to sell their wares to the general public. The cookie sale is the largest fundraiser for Girl Scouts. It teaches goal-setting and salesmanship and helps fund troop activities, as well as council-wide programs and operations. The origin of cookie sales by Girl Scouts is murky, but in 1917, the Mistletoe Troop in Muskegee, Oklahoma is known to have baked cookies at a local school cafeteria as a fundraiser. The idea spread in the 1920s and typically Girl Scouts and their mothers would bake and sell cookies, often going door-to-door and offering cookies for 25 or 30 cents per dozen. 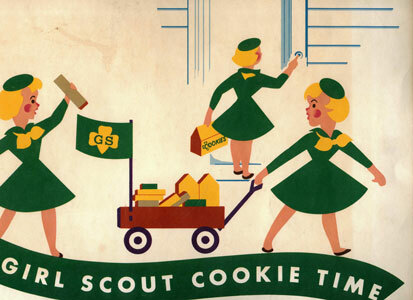 In the late 1920s and 1930s, individual Girl Scout councils began to contract with local baking companies for cookies. In 1936, the national Girl Scout organization decided to license the first commercial bakeries to produce cookies for the various local councils. The most popular Girl Scout cookie remains "Thin Mints," which date from 1939 when one of the first nationally licensed bakers created "Cooky Mints," an early version of this treat. This year, 90 Girl Scout troops in River Forest, Oak Park, and Forest Park sold over 112,600 packages of Girl Scout cookies.